The greatest misconception about small kitchens is that they are always cramped, lack storage and workspace. Cantilever believe that the size of a space has no bearing on its potential, and appreciate the design challenge of a small scale Kitchen! 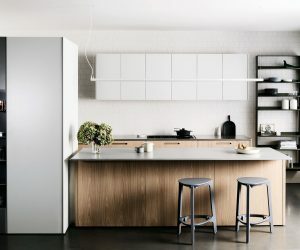 Compact Kitchen design requires flexible thinking – not a shrunk down version of a full-size design. 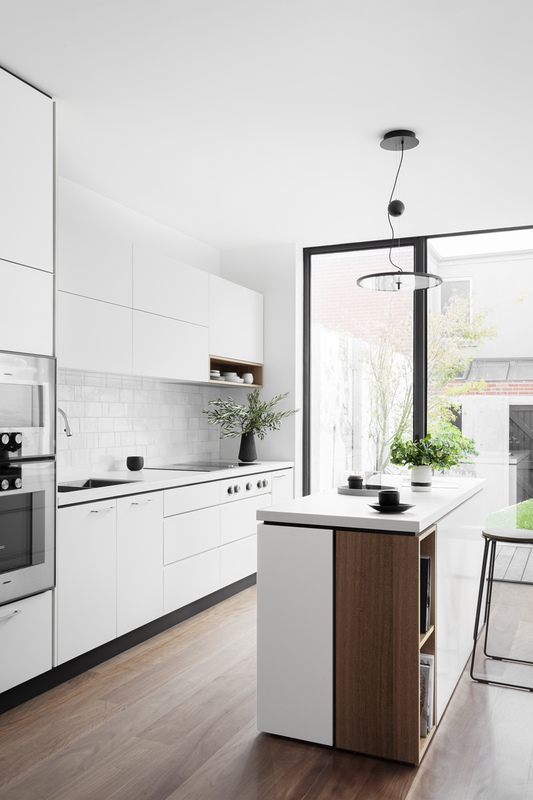 A recent project; Mills Street; showcases some key design elements worth considering when designing a compact Kitchen. 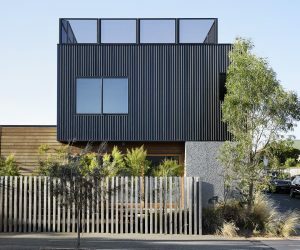 When it comes to compact – smart design is critical. 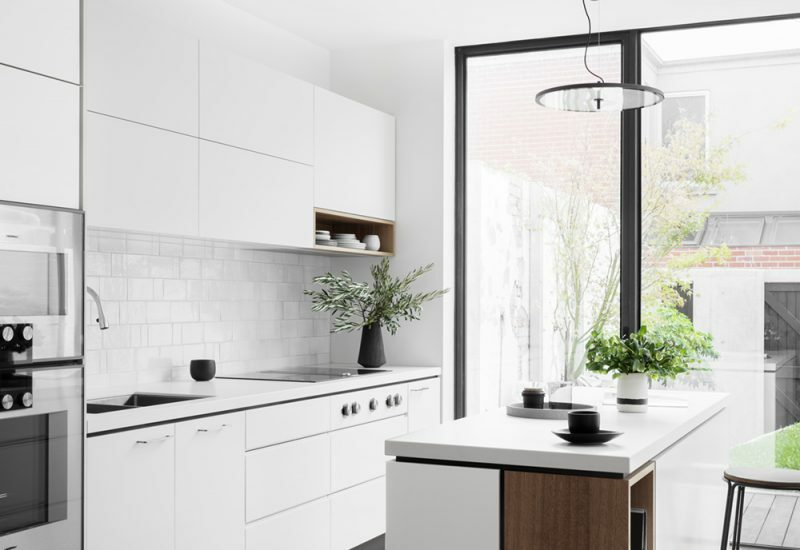 Small kitchens naturally have a high density feel about them, with a myriad of visually competing components squished together. A simple palette is needed to neutralize this, making the space feel bigger. 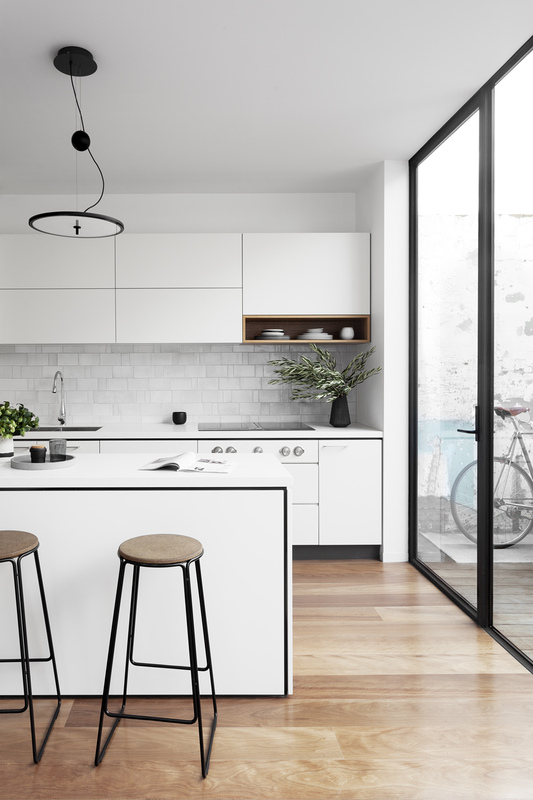 The Mills Street project palette exemplifies this technique, using Integrated appliances, Cantilever steel handles, a soft grey splashback tile made by Anchor Ceramics and timber accents. 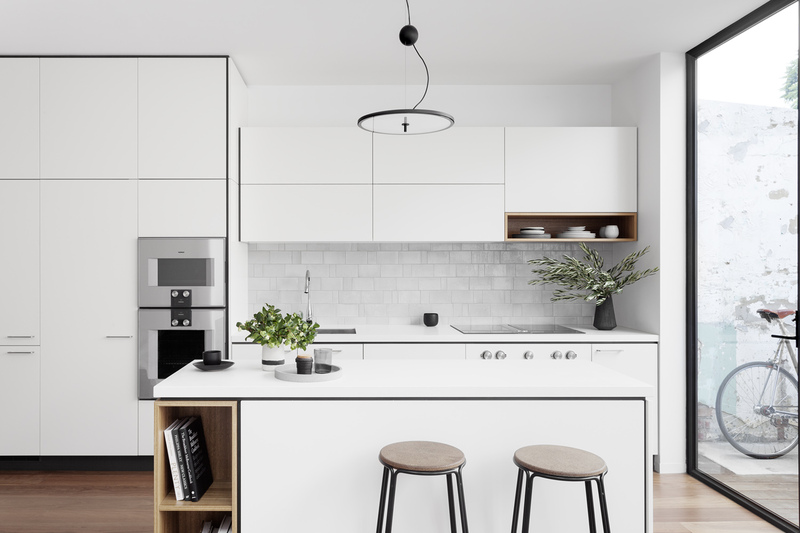 Appliances can make or break a compact kitchen. 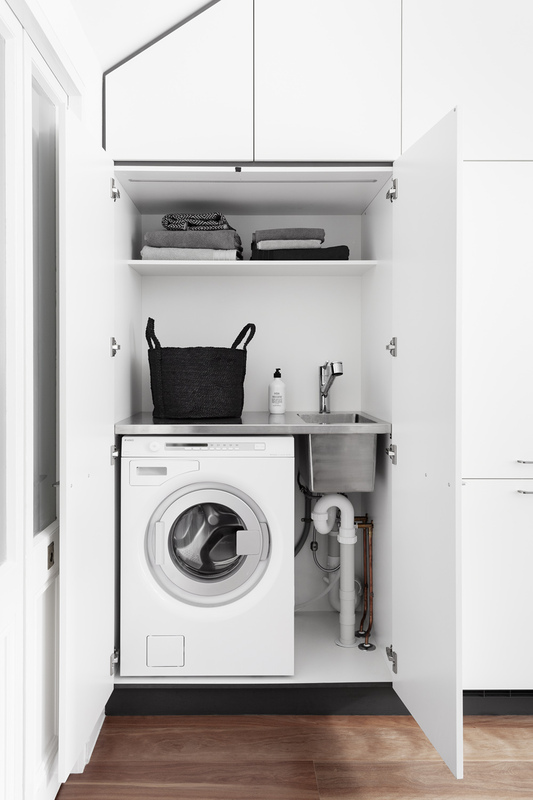 Choosing tall and narrow appliances shifts the organization vertically to free up horizontal storage space. As pictured, our client invested in a clever cooktop with integrated downdraft. The cupboard above a cooktop usually stores a range hood, limiting storage options. 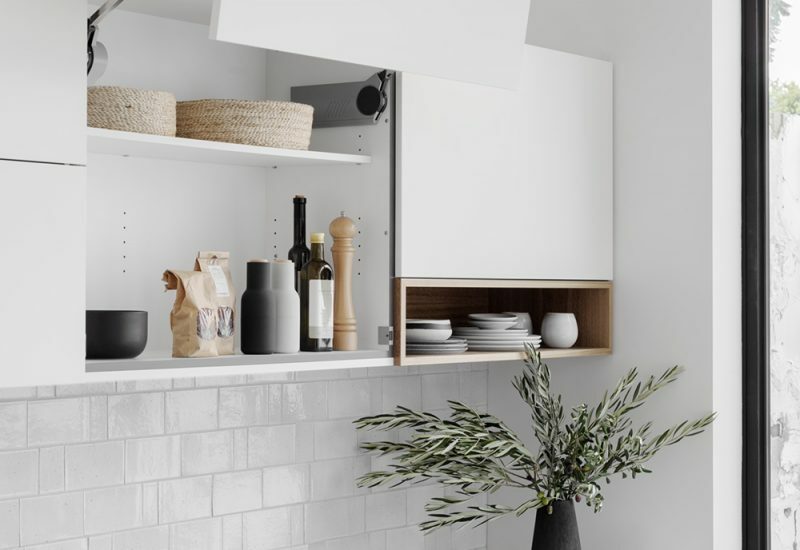 The downdraft system moves the ‘range hood’ component below bench top, freeing up overhead space for cook-zone storage, which in turn alleviates bench space. Integrated bi-fold hardware works to improve access and visibility to the contents of this cabinet group. Task lighting is a must. You should never have to fight your shadow particularly when a mandoline slicer is involved. Our integrated LED strips sit flush within the overheads and offer brilliant coverage to the workspace. Skylights, window splash backs, and floor to ceiling windows are a wonderful way to let natural light and open up the space. The strength of a small space is its ability to create an intimate environment. Use this to your advantage by incorporating ambient evening lighting either via adjustable downlights, pendants or wall lighting. 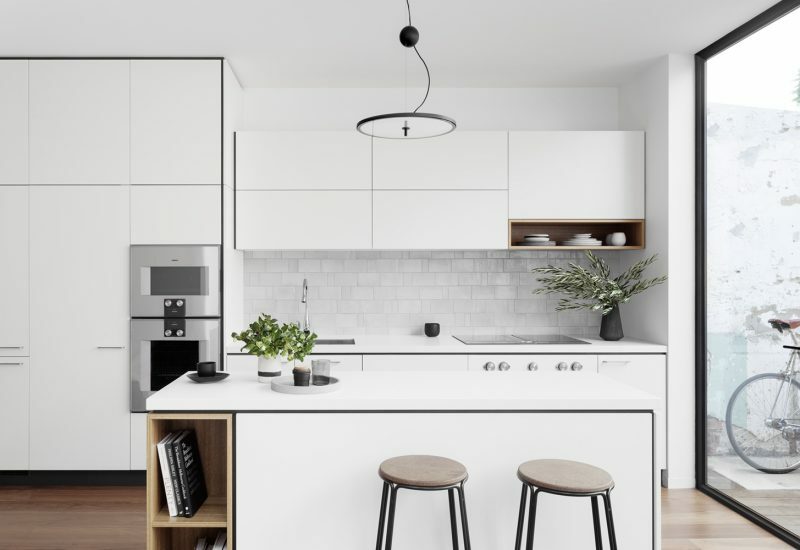 Open plan spaces are by their nature multipurpose, so the joinery should be too. Work zones traditionally housed in their own rooms can be merged, improving efficiency of space and placement of utilities. 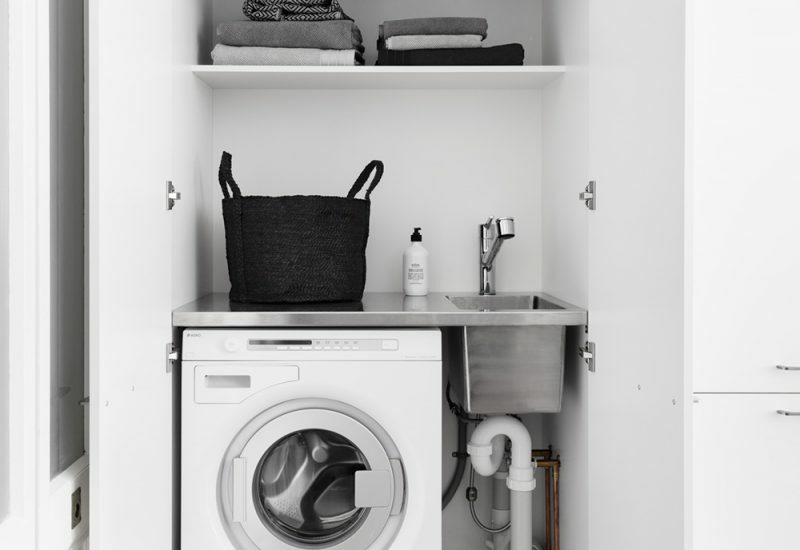 Our Mills Street project exemplifies this idea, by extending the galley format to incorporate a narrow euro laundry with custom designed stainless steel bench and sink. 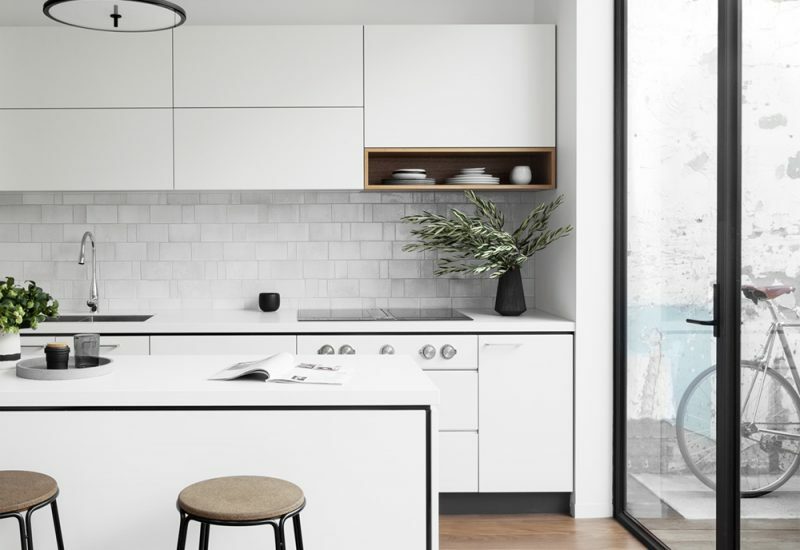 This not only gives the illusion that the kitchen is grander than it is; but also allows for the addition of a Laundry to the premises without affecting the homes’ floor plan. In this design, the narrow footprint of the island maintains workflow access, whilst the service free bench top provides the extra space needed for food prep and plating, casual dining or even laundry sorting! 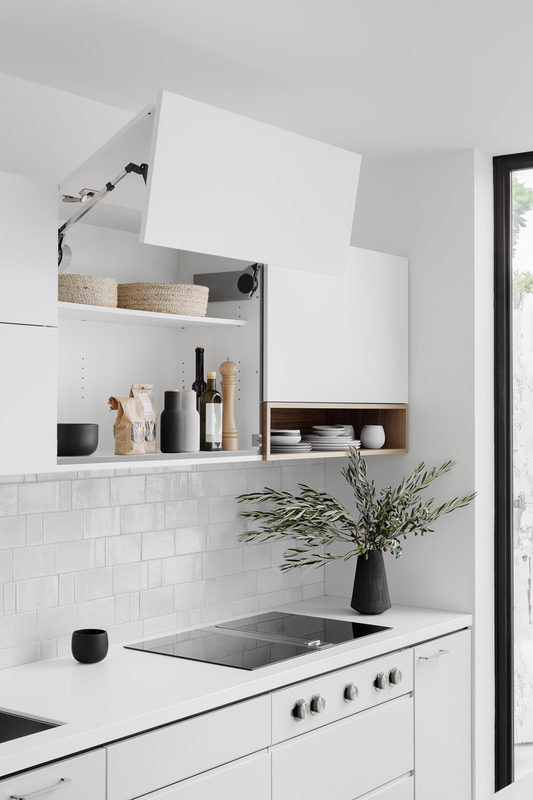 The inset Open Mitred Box in blackbutt anchors the simplified form within the space and provides further display cabinetry for cookbooks or oft-used homewares.